President Obama's campaign website added "clean coal" to a list of energy priorities late this week, days after Republican lawmakers noted the omission and a federal inmate received about 40 percent of the vote against Obama in the Democratic primary in coal-heavy West Virginia. Previously, the campaign's website highlighted "fuel efficiency" on a list of seven energy priorities, but it has been replaced by "clean coal" and the site now touts Obama's "10-year goal to develop and deploy cost-effective clean coal technology." 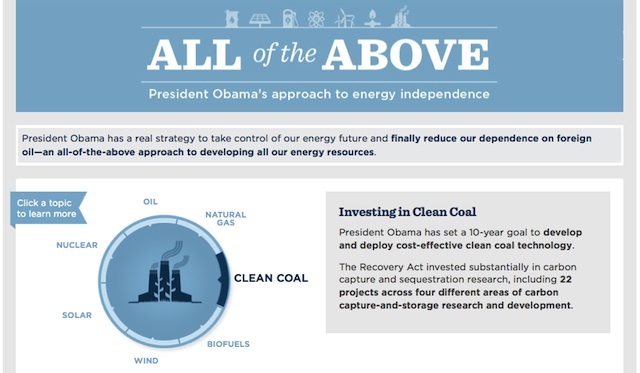 While the addition to the website is new, Obama's support for clean coal is not. The president officially supported investing in clean coal technology even before he was elected president, but the fossil fuel was not listed on this particular webpage until this week. In response to inquiries about the new language, Obama campaign spokeswoman Lis Smith noted that the president "has supported clean coal technologies" and that "employment in the mining industry is at a 15 year high," but she did not address why clean coal was recently added to the site. The administration has come under fire from Republicans recently who allege that Obama has not shown enough support for coal, one of the nation's primary sources of energy. Under Obama, the Environmental Protection Agency has proposed regulations that include higher emission restrictions on coal plants. Kentucky Republican Rep. Ed Whitfield, chairman of the House Energy and Commerce Committee's Subcommittee on Energy Power, criticized the Obama campaign earlier this week for not including coal in its "All of the Above" strategy on the website, calling the omission "glaring," according to the Wall Street Journal. Upon seeing the new Obama webpage Friday, Whitfield said he was still "skeptical." "Well, at least the president is finally acknowledging our most abundant energy resource, coal," he said. "However, I'm skeptical he will actually do anything to draw on this resource."